Russia finally confirmed that a bomb was responsible for the plane crash that left 224 people dead last month. 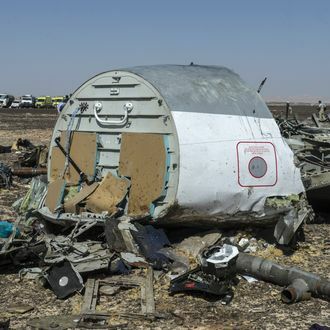 ”Traces of foreign explosives” were found on the debris of the Russian A321 airliner, which scattered all over the Sinai Peninsula in Egypt after exploding midair on October 31. “We can say definitely that this was a terrorist act,” the head of the Federal Security Service told Russia’s Security Council, according to the New York Times. He added that Russia was unable to confirm that ISIS — which claimed it had carried out the attack immediately — was responsible, but the government is offering $50 million for any information about the attack. British Foreign Secretary Philip Hammond said there was a “high probability” that ISIS was responsible for the attack last week. “It may have been an individual who was inspired by ISIS who was self-radicalized by looking at ISIS propaganda and was acting in the name of ISIS without necessarily being directed,” he said. U.S. intelligence officials already suspected that the plane had been brought down by a bomb. Two weeks ago, President Obama said, “I think there is a possibility that there was a bomb on board and we’re taking that very seriously.” Russian officials originally scoffed at the idea that a bomb may have gotten on the plane. Egypt has also been reticent to admit or agree that an explosion brought the plane down, given the injury it could cause to the tourism industry. Most airlines have stopped flights to Sharm el-Sheikh, the resort town that the downed plane was returning from, already. The bomb contained about two pounds of TNT.